We stayed at OK RV park. It was OK. It was funny because it looked like a used RV and Jeep Wrangler car lot. This is Jeep heaven. I’m not sure how many total designated 4×4 trails there are but wish I had more than a week to explore them. We parked here because it was only 15 minutes from Arches National Park and 45 to Canyonlands National Park. You can visit my other blog posts on those adventure days by clicking on the links. The girls and I used the local library in town to do our school work. This library is super busy with people coming in just to use the wifi and to charge their devices. We saw several vans parked in the parking lot each day. They advertise on their website that this is a place for transits to to such things. There was also a resident black cat that would sneak in through a window daily that would visit with us. The girls loved having a pet cat for a week. 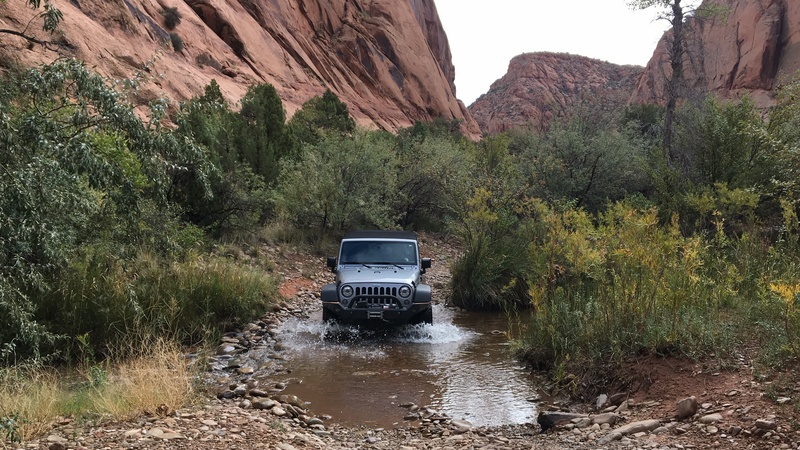 I used the Jeep Badge of Honor app to locate trails to go off roading with the Jeep and to earn a badge to put under my Trail rated badge on the side of my Jeep. Here is a picture of my 1st Jeep Badge of Honor I received from back in April (I just received it). I can’t wait to get the four I earned here in Moab. There are 6 designated Jeep Trails here. Moab is the location of a nine day Jeep Safari, leading up to Easter every year. This trail was only 10 minutes from our RV park and the girls came with me. They loved this trail because we crossed water three times in the Jeep. We also stopped and rock climbed along the way. This was my second favorite trail but we did not complete it because the girls were a little freaked out by the cliffs. We did have great views of the Colorado River. Right next to the Poison Spider Trailhead is a hiking trail head that has petroglyphs and dinosaur tracks. It is way cooler to see dinosaur tracks where they were discovered than in a museum any day! The petroglyphs are so abundant in this area that it almost loses it’s excitement. This 10 miles long trail is located in Sand Flats Recreation Area which requires a day use fee be paid at the entrance gate. This trail is also located in Sand Flats Recreation Area and is a 6.5 mile roller coaster on slick rock. The ranger did not advise that I do this with my stock Rubicon and alone. He said Fins and Things would be fine and that there were people on that trail if I needed help. We ate at Peace Tree Cafe one night after hiking in Arches and we had come out of the park after not having cell service and finding out about all the Hurricane Micheal destruction to our home town of Panama City, Florida. We let the girls bring in their books to dinner and read while we got online and read all the news and saw all the pictures that were flooding our Facebook pages. Chris and I were sharing all the information with each other and not caring that we looked like a family that doesn’t care about talking while we share a meal- this was important. As we were sharing the shocking pictures, a lady that had been sitting behind us approached our table and asked if we were from Panama City. It turns out she also went to high school there and her mother still has an apartment there, right down the street from my mom. It was wild that we were in Moab, Utah and met someone from Panama City, FL. We at at Zax Pizza out last night here after hiking the Devils Garden trail. We were starving so the all you can eat pizza and salad was perfect! My sister asked if we were near the ‘Hole in the Rock’ so I had to find it and go! Albert and Gladys carved their 5,000 sq ft house out of this rock by hand. It took them 12 years to get it the way they wanted. They operated a diner out of the first room for the first 5 years that they lived here. After Alfred died, Glady’s lived another 11 years. They are both buried here. They were both a very eccentric couple. We took the tour of the inside to see all 14 rooms for $6.50 each. They don’t allow you to take pictures.